What happens when an outfitter/fly fishing lodge owner falls in love with the lady president of a Trout Unlimited chapter? Well, fishing, lots of fishing. A true trout romance unfolded before our eyes when Dan Delekta met Nancy Alston. Dan is easily the most expert guide we know. We have seen him catch fish when no one else, including other guides, could manage to do so. Nancy is fanatically expert in her own right, owns her own drift boat, and fishes without regard to weather. They quickly settled into catching a lot of trout together. Somewhere amongst all those rainbows, browns, cutthroats, brookies, and the stray grayling, they decided to marry. We were delighted with the news as we cannot imagine a better match for either of them. Since they love our jewelry, they asked us to make the wedding rings. This turned out to be a major challenge as Nancy, who has small fingers, wanted everything in the world on these rings. 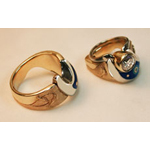 The requirements were to accommodate a large diamond, inlay, and a sapphire, a fishing scene, and also use both white and yellow gold. Her ring had to be made as two rings so the diamond could be worn or not depending on the circumstances. Our solution to this design problem was to go fishing with them. We are not dumb. Enough fishing will solve nearly anything. We took a lot of photos of them in their boats. The idea was to have Dan rowing Nancy’s Clackacraft with her fishing on her ring and to have Nancy rowing Dan’s Lavro with him fishing on his ring. Each scene had to fit in approximately 1/4 inch. This was a considerably difficult carving. I did manage to get the boats identifiable by their paint lines. Dan and Nancy are identifiable primarily by stance and by their hats. I even put sunglasses on them. Nancy’s fly line curls around the ring going underneath and coming up on the other side where I carved a tiny trout. Since Dan’s ring was larger we had him catching a double with two little trout on the side of his. 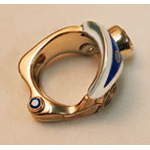 The sapphire went on the lower part of her ring as a surprise stone. One happy result is that when the inlay pattern was created to fit with the other elements of the rings, it looked rather like a stylized bear fetish. 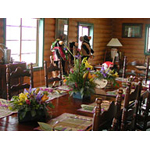 Since Dan’s lodge is the Beartooth Fly Fishing Lodge he was delighted with the idea. 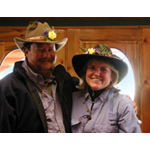 On the wedding day, they dressed in new fishing shirts, yellow roses on their hat bands, and their waders. The wedding party took three boats to launch at Ruby Creek on the Madison River where the bride caught a fish on her first cast. The short float to Macatee Bridge goes right by the Beartooth. So we landed the boats there below the lodge and I married them on the bank. They had chosen not to see the completed rings until they put them on during the ceremony. Is that trust in the jewelers or what?!? 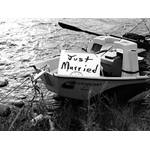 While they were looking at the rings after the ceremony, I sneaked down to the boats and tied the “Just Married” sign on the back of their boat along with bright ribbons tied to plastic two liter pop bottles that would float. Thereafter all the other passing drift boats cheered and waved to the newlyweds. Back at the lodge Nancy gave Dan my husband’s painting Under the Madison as a wedding gift. Since we had told Dan his favorite painting had been sold to someone in New Jersey, he certainly was not expecting to see it again! No one was at all surprised that Mr. and Mrs. Delekta decided to spend their honeymoon steelheading in Oregon.